I don't know about you, but I've had enough of winter and it's cold, cold wind. I hate being cold in my house because the furnace can't compete with the draft coming in the window. I hate having to wear layers and layers of clothes. I don't mind having Buffy snuggle up in my lap, though - she's such a sweetie and is warm and fuzzy and loving. I decided to make a couple of tops for spring, if it ever comes, while still procrastinating on the cables cardigan that would be better for the weather now. 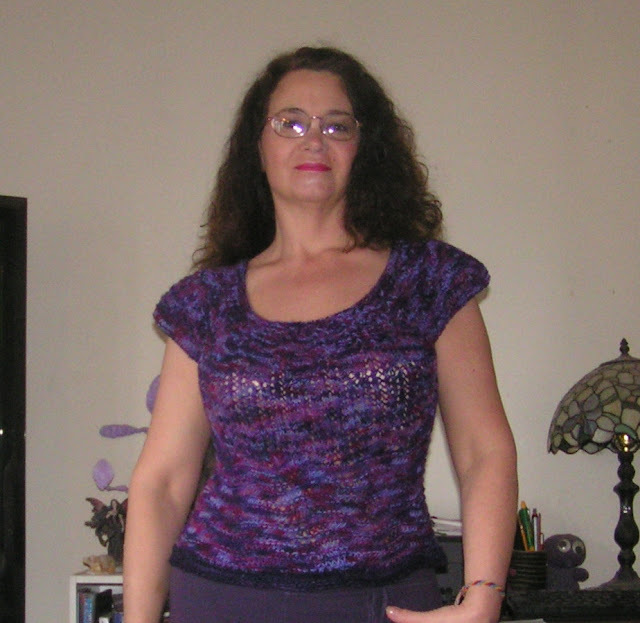 First is a top called Paloma from the book French Girl Knits. I've made this before, but it's rather quick and doesn't take much yarn. I had three skeins of sock yarn from a friend and it was just about enough - I had to use a bit of coordinating yarn for the bind-off and sleeve edges. 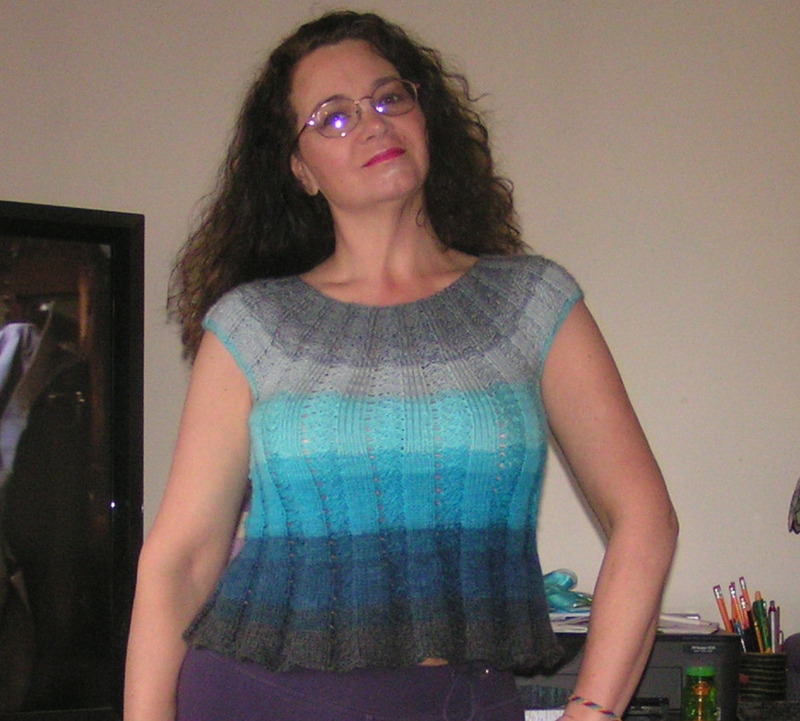 The other top was inspired by the yarn. I found this at Wal-mart when Khloe and I were finishing our holiday shopping. It was so pretty in the ball - all striped and calling to me. It's called Mandala by Lion Brand. This top took just one ball. I really like how it turned out. I have found out that they make this in purples. Yay! I want to get maybe three balls to make a dress after I finish the couple projects going right now. I've wanted to knit a dress for a long time. It may even be this pattern. It was fairly easy to knit and would look nice with some length, I think. It has short sleeves, but I couldn't knit them and make the stripes work out, so my top is sleeveless, but maybe with more yarn the sleeves would work. I couldn't get a good picture of what the cats got for Christmas (after Christmas, but they don't mind). Last year we looked at cat trees at Pet Smart and they were so expensive! I love these kitties, but I can't really justify spending over two hundred dollars for a tree. One of my friends at work found one on Chewy.com for 40 dollars and showed me a picture. It was just what I wanted. I ordered one and Eric put it together while I was working. The cats were wary at first, but I sprinkled some catnip on the platforms and now they love it. 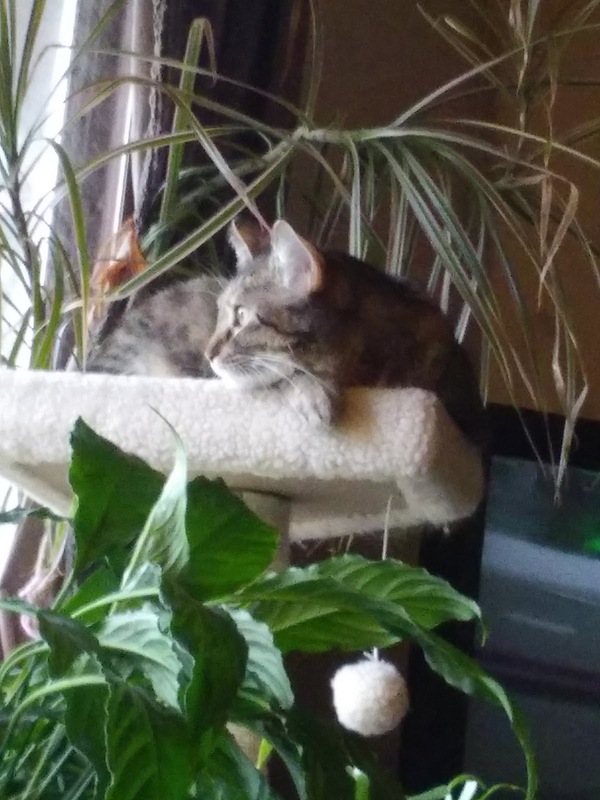 Here is Buffy in her new spot - right on top where she can oversee her kingdom. She loves being at face-level with us. Joshua is very healthy right now and races up and down like crazy. It gives him plenty of exercise but makes him eat like a horse. He's healthy, though, and that's all that matters after how sick he has been. You may have seen on instagram that we got a new washer and dryer. Our old ones were over fourteen years old and were starting to not work very well. The spin cycle made the washer sound like it was going to explode! We went to Menard's last Sunday and Eric let me choose which set we should get. It will take us a little while to get used to them, of course. I feel like such a grown-up for being excited about appliances. I didn't make any resolutions this year. I've made a list of things I want to make, but we all know that my attention span is like that of a hyperactive toddler with a sugar buzz. Most of the list is stuff that didn't get finished last year. We'll see how that goes. I'll share what I make, of course. I just need to clean out my sewing room and decide what to make first. Have a great week, guys. I hope lots of good things happen to you! See you soon. The tops look very lovely. A knitted dress would be awesome! Love both tops but the purple one is so fab. Whenever I see cat trees in stores I want to play on them-wonder if I was a cat in a previous life? The tops you made are beautiful, especially the second one!!! My sister has just got a kitten called Buffy! !